“Beginning Mobile App Development” is designed for use in the classroom. 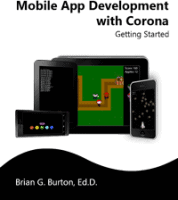 The two books have the same instructional content, but “Beginning Mobile App Development With Corona” includes assignments and teacher resources. I have just bought your “old” book and everything works fine for me! Up to now. But working with chapter five, I wasn’t happy with the look of the greenDinoSheet in both the first exercise and in the second! I tried to change the look by changing the code for greenDinoSheet like you had for redDinoSheet (Uniform), but I got an error message “sequence frames must be inside the sheet”! When looking into the two sheets and compared it with the corresponding lua-files, it looked like the lua-file for the green dino was wrong, but I’m aware that it must be me who did something wrong. I also tried just to change the red dino section to handle the green dino sheet, but still I got the same error. Can you please give me a little hint?